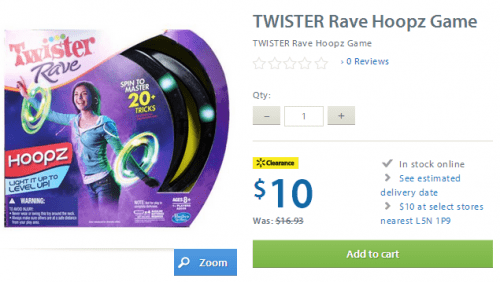 Walmart Canada Currently HAS fantastic deal on the game TWISTER Rave Hoopz game! Instead of paying the initial price of $ 17, you can Spend $ 10 for hours of fun. This offer is available online and in select Wal-Mart Canada. Click here to see this offer Clearance Walmart Canada . In addition, click here for all offers online Walmart Canada .